Fairybell® Christmas Light Collection, Now Available Nationwide To Customers Of The Flag Company, Inc., Just In Time For The Holiday Season. 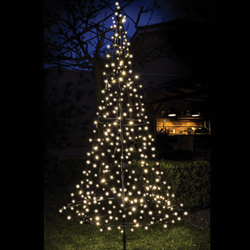 The Flag Company, Inc, a leading retailer of flags, flagpoles, and accessories in the United States, has launched the Fairybell® Christmas Tree Light Collection, with three great products: Fairybell® Christmas Tree Door Lights, Fairybell® Flagpole Christmas Tree Lights, and Fairybell® Christmas Tree Kit. The Flag Company, Inc. Vice-President, Mike Lawrence, states these products are a perfect touch of embellishment to any Holiday decorations at home or at work. “The Fairybell® Collection makes it easy for anyone to enhance their Holiday décor, by simply adding these bright LED lights forming a Christmas Tree to their doors, or flagpoles,” Mr. Lawrence said. “It’s affordable, yet made of very high-end materials, and the kit has everything you need,” he continued. The Flag Company, Inc. partnered with Hemsson, Inc., makers of Fairybell®, to offer this great product through FlagCo.com, the company’s main webstore. With full warranty for two years, these products are built to last and withstand most weather conditions. The selection of Fairybell’s three best-sellers are a great complement to the wide spectrum of flags, flagpoles, and accessories already offered by The Flag Company, Inc. Located in Acworth, Georgia, The Flag Company, Inc. has been locally owned and operated since 1989, being recognize for their customer excellence and high-quality product standards, made in the USA. They’ve been operating their webstore since 1996, making them one of the oldest e-commerce sites on the web. The Flag Company, Inc. staple product is the Farming Flag®, the miniature stick flags that Real Estate Agents have traditionally distribute. From there, the company grew to other areas, always selling the best quality products at very reasonable prices. Carrying a wide array of international, military, message, religious, and nautical flags, The Flag Company, Inc. positioned itself as the world’s best online source for all flags and accessories. Today, The Flag Company, Inc. runs on five major divisions, including Flags, Flagpoles, Lighting, Graphic Design (Custom Flag printing), and Warehouse & Shipping.